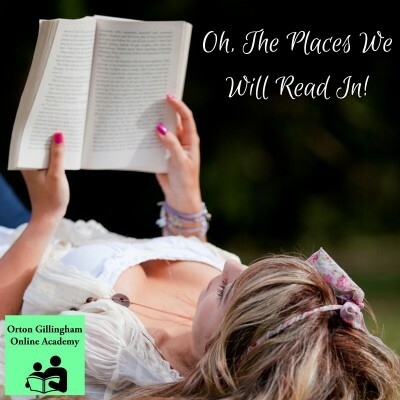 Oh, The Places We Will Read In! Lorna is certified by the Dyslexia Training Institute and is experienced in implementing the Orton-Gillingham approach to teaching. She has completed the DTI Dyslexia Advocacy Certification Course and the Orton-Gillingham Online Academy Basic Language Course (Level 1 certification). She is currently working on her Level 2 certification through Orton Gillingham Online Academy to enhance her morphology skills. She is a Level 1 Certified Handwriting Specialist with Handwriting Without Tears and is listed as tutor through Handwriting Without Tears and the Learning Ally Reader Network. Lorna has a unique perspective on this condition as she is dyslexic herself. I noticed that Learning Ally is offering “The Great Reading Games” for school students, and although this is only available to schools with Learning Ally membership, I wanted to do something for the students we tutor to motivate them to read more this winter. Despite obtaining Learning Ally membership for many of my students, so they could more often “ear” read instead of having to deal with the stress of “eye” reading and decoding text slowly at a grade-appropriate level, they haven’t done as much reading as I had hoped. I felt it was time to focus on this issue and kickstart reading on a regular basis. To do this I enlisted the help of our son to help me format a short reading challenge for our students, starting next week and lasting six weeks. I wanted it to be fun and for the recording of books and reviews to be simple. Today’s blog was provided by Lorna Wooldridge of Wise Owl Services. Wise Owl Services provides one to one Orton-Gillingham tutoring for dyslexic students. Lorna and her family are also the creators of Schoolhouse Games, which provide unique card games that were devised to improve the working memory skills of those that play them.